FYMgraphics and FreeYourMind - the mind mapping solutions for Windows Mobile. Both programs are compatible with FreeMind version 0.8.x and version 0.9.x, the free mind mapping software for desktop computers. 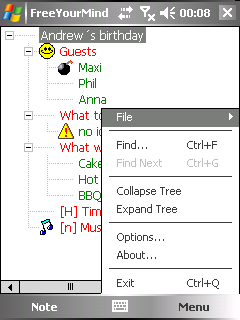 Everybody who has worked with FreeMind on his desktop computer might have had the desire for viewing and editing the mind maps on his Pocket PC. This was the reason for me to develop FYMgraphics and FreeYourMind. The functionality of of the programs will be constantly enlarged. You can take part in decision-making of the next steps by sending me an e-mail containing your requests (Support). FYM is developed with SharpDevelop. SharpDevelop is an Open Source IDE for Microsoft .NET Framework. I use TortoiseSVN for version control. "The coolest Interface to (Sub)Version Control."